Quick overview This ground-breaking book will give you the skills you need to become an advanced coach, focusing on both empathy and outcomes. This ground-breaking book will give you the skills you need to become an advanced coach. Coaches tend to come from either a business background or a helping profession background, and each finds the other's approach limiting. The concept of coaching with empathy, in other words giving the coaching client your total attention, is a winning combination of focusing on both empathy, to uncover psychological blocks, and outcomes, to improve performance and initiate change. The emotional world of clients has been problematic, as coaches are wary of getting into therapy, and emotions may even be ignored in a premature focus on solutions. Yet, without engaging with our clients' emotions we can't coach. 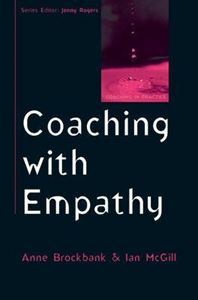 This book will teach coaches the skill of empathy and explain its key role in client change. You will gain the confidence to use different levels and modes of empathy in a range of settings, to suit your client's stage in the change process, whilst maintaining a focus on solutions and outcomes. The book promotes a combination of the empathy together with a focus on change and shows coaches how to make a lasting difference to their clients.